The 6-mile horse trail circles Westwood Lake providing both scenic views and a rolling terrain. Riders begin at a Day Use horse area, which provides parking, hitching rails, drinking water, and vault toilet facilities. 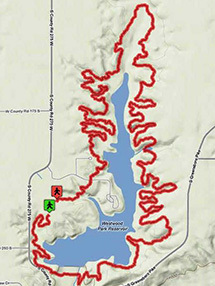 Riders can choose to ride in either direction around the lake. This area closes at dark and is also closed during the winter season and overly wet conditions. Please call the park at (765) 987-1232 to ensure the trail is open. Horses are not allowed in the lake at any time. The horse trail intersects with the bike trail at two locations, slow down and use caution when approaching and crossing the bike trail. There is also a short section of shared trail and the horse rider always has the right-of-way. Consumption of alcoholic beverages while riding the trail is NOT permitted. Trail will close if conditions are too wet; call before coming out.